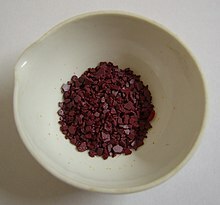 Chromium(VI) oxide, also known as chromium trioxide, is a chemical compound. Its chemical formula is CrO3.It has chromium in its +6 oxidation state. It also has oxide ions. It is a solid used in cleaning glass. Chromium-6 is odorless and tasteless. ↑ "ChemEurope--Chromium trioxide". ChemEurope. Retrieved 15 November 2010. This page was last changed on 3 October 2018, at 13:54.